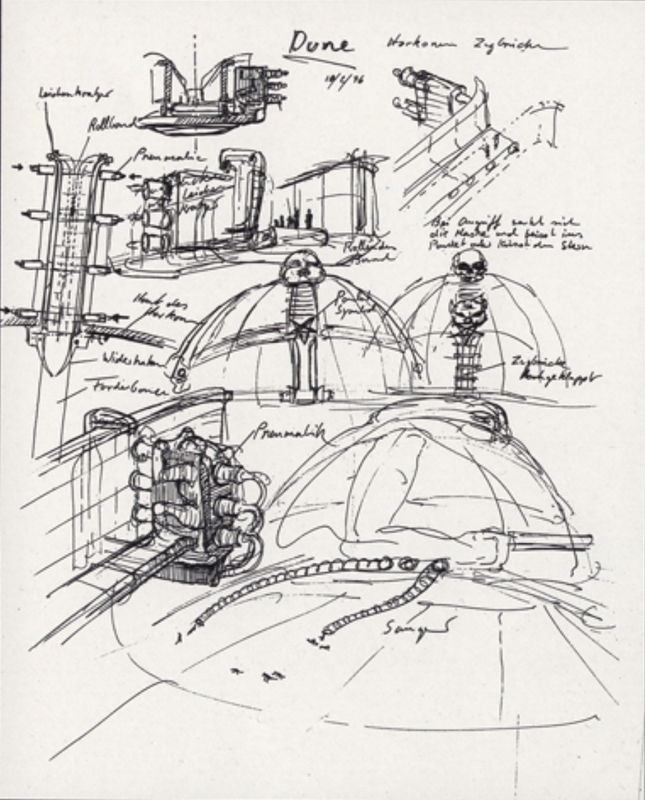 a) Jodorowsky remembered that, rather than leaving it to just one of his own assistants after he had met him once in Paris, he spoke with Giger on the telephone a lot of times about every drawing and he would tell him what to do, such things as "you need to make a palace where Baron Harkonnen lives, an enormous space, big, like pyramid, and that is the image you project, the image of Baron Harkonnen. And the plane come here, and the edifice, the palace, opens its mouth, and a giant tongue comes out. In the tongue of this enormous Baron Harkonnen, the helicopters fly in to the airport. " 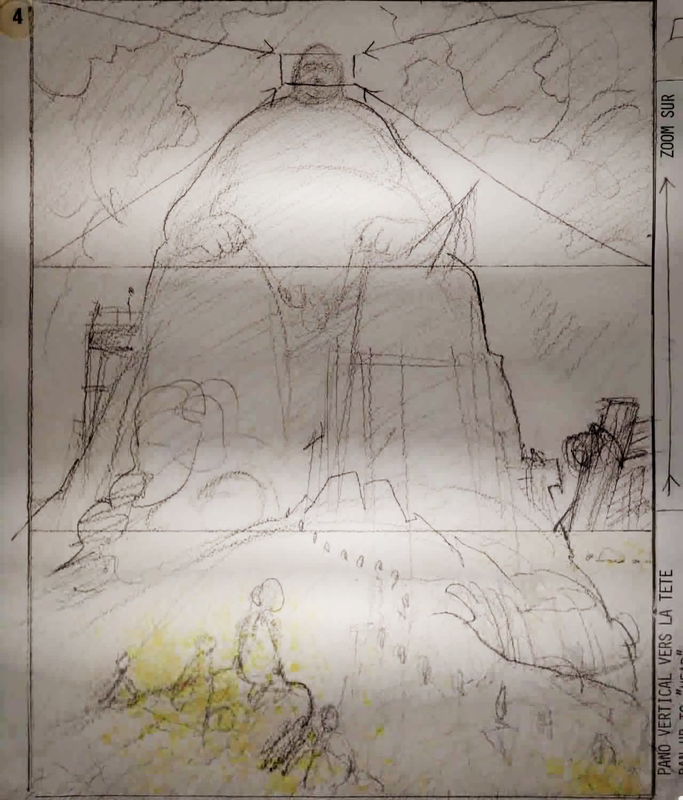 b) Moebius storyboards would display the Castle Harkonnen as basically shaped as a giant seated statue of the Baron Harkonnen himself. So it was as if the Baron lived inside himself. The castle's tongue would come out and then a space ship or helicopter would come in through the tongue. 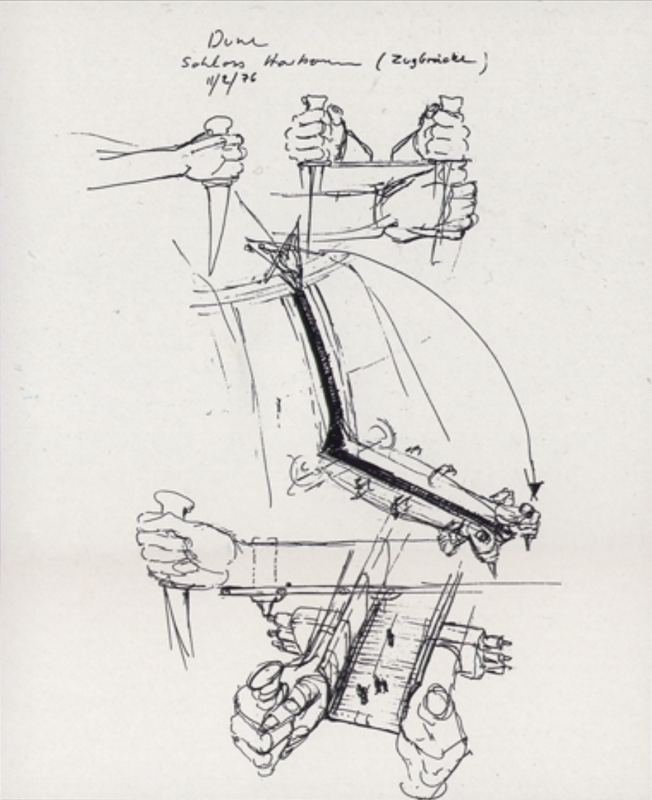 In order for someone to go to the castle by foot, there was a pathway with tubes on the side, and from the tubes would come out knifes and one had to avoid being impaled by these big knifes or spears. 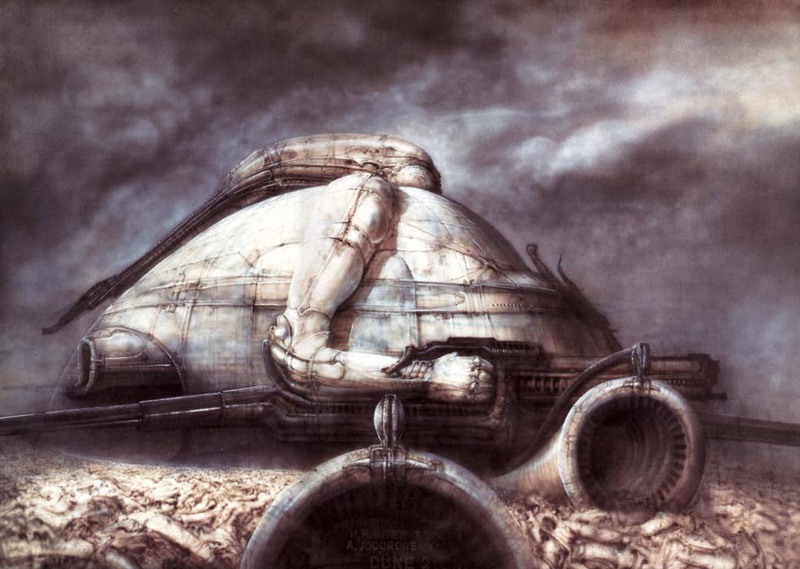 The castle Harkonnen was never actually in the novel but came out of Jodorowsky's interpretation. 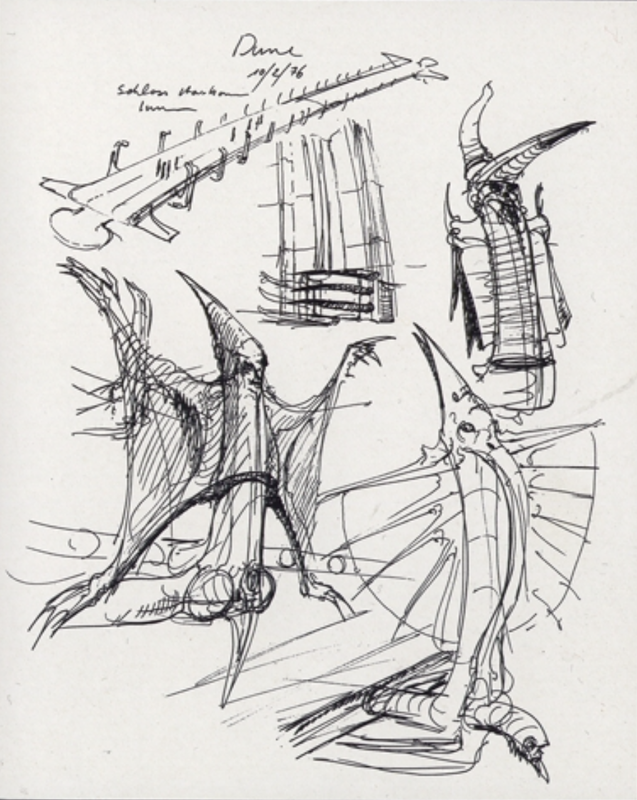 c) So Giger put down his ideas on paper and soon went back to Paris to hand them to Jodorowsky, who in turn flew to the US in search of a producer taking Giger’s work and the work of the others. d) Nothing happened after this, Jean Giraud/Moebius would claim that it was Dino De Laurentiis who stopped Hollywood from financing Jodorowksy because he wanted the project himself. After so Giger was left with the address of Dan O'Bannon who was in a state of disappointment. Alexandro Jodorowsky: I say to him, I need you as you are, you are searching in the deepest darkness of the soul , and that is good, that is your art, or your artist, for me it is marvelous id art, marvelous id art, necessary for the Baron Harkonnen. 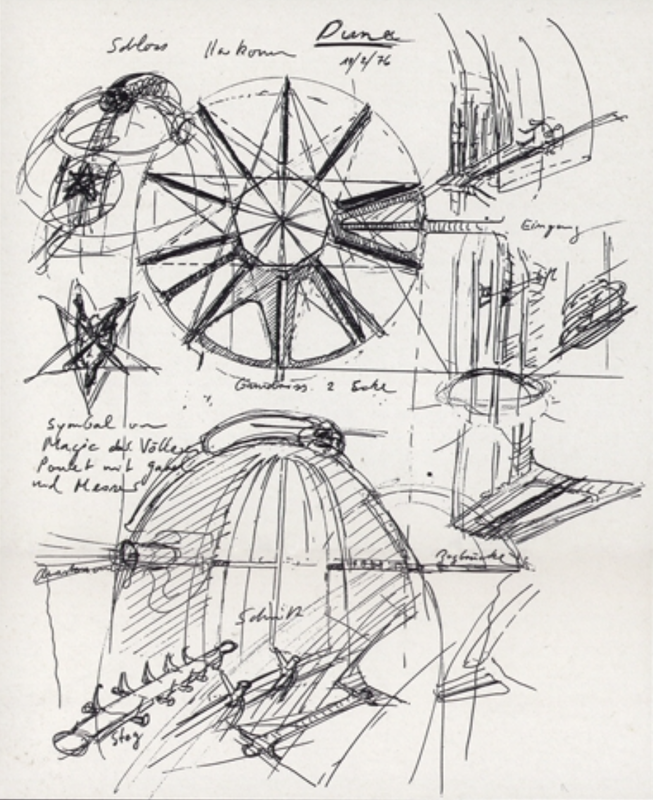 HR Giger: I met Jodorowsky for the first time in Paris. This was the evening when he attended... a Magma concert. 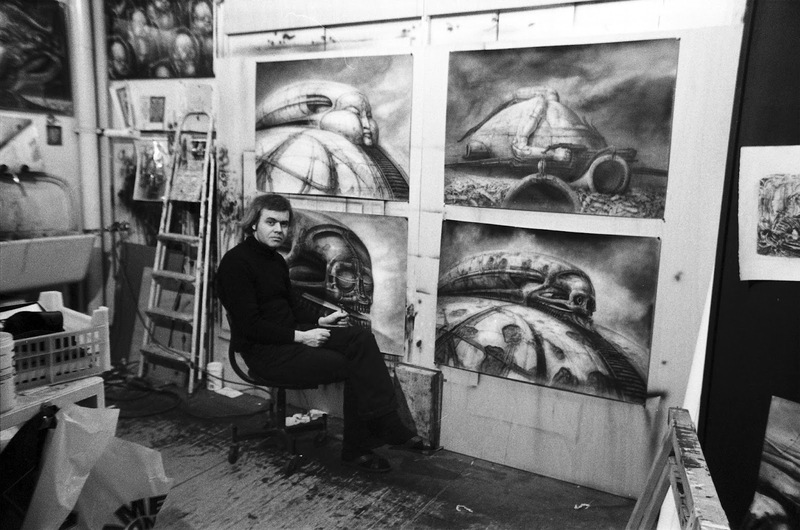 HR Giger: I had the artworks from the movie which I got from Moebius, who drew the storyboard, where one can see the Harkonnen Castle. The castle was the big Baron Harkonnen, no? The big sculpture. That was where Baron Harkonnen lived. In himself! The big ego, no? The castle open the mouth, a tongue go there, out... and the spaceship came in the tongue. HR Giger I was fascinated by the creation of the Harkonnen people and when I airbrushed five paintings I gave my best to create these designs. Alexandro Jodorowsky: In order to go to the castle, there is a way with tubes. Enormous tubes. (schick) Come out knife. (schick) And then in order to go to the Baron Harkonnen, you need to walk with this way... (schick) escaping of the big knife who want to destroy you. 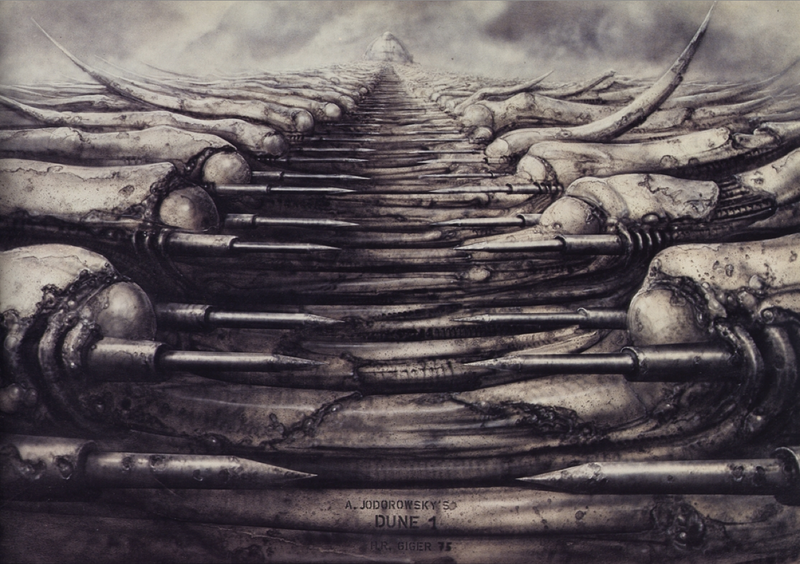 HR Giger : If attacked, then the spears would be set in motion and impale the people who stood in the way on the pathway up the castle. 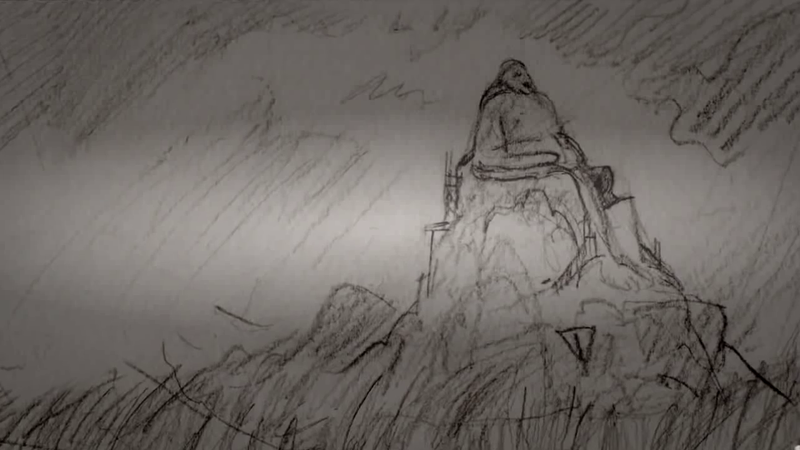 And in fact this Harkonnen fortress was never in the novel. So this was somehow in Alejandro Jodorowsky's translation, his interpretation of the story.